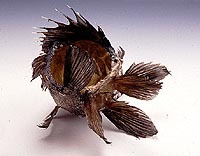 Our current show presents the unique work of five artists who expand the meaning of fiber to include animal membranes, organs, and fish skins---natural elements recycled to create fascinating sculptures that seduce and surprise us. Inherently beautiful, these pieces are a much needed affirmation of rebirth and the continuation of life. 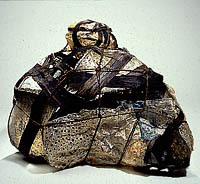 The elements of structure and skin come together in Pat Hickman's work. Stretching animal entrails over invented skeletons she draws our attention to the interplay of light and form. This contrast between opaque and translucent surfaces encourages a discussion of life and death, permanence and transcendence. 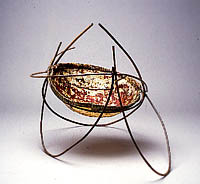 Jan Hopkins assembles unexpected materials from the natural world into non-traditional basket forms. Citrus peels, sturgeon skin, lotus pod tops, these become the pieces of her innovative puzzles. The work of Peggy Vanbianchi comes from the heart, literally. "I construct many of my pieces from beef organs. These pieces refer to human hearts, and are metaphors for the fragility of life." Her conceptual pieces, whether hearts, books or maps carry personal references familiar to all of us. Jill Nordfors Clark creates beautiful lacy structures with traditional needlework techniques. Their fragile appearance, however, belies the strength of the hog gut she uses. 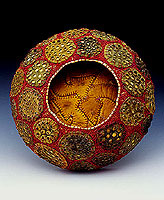 Fran Reed's artistic influences come from the Alaskan environment in which she lives. 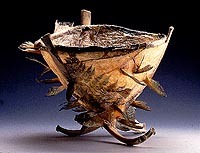 She continues Native Alaskan basketry traditions with salvaged fishskin and gut. The results are alluringly rustic yet sensuously appealing. 8'3" x 40" x 2"
27" x 38" x 35"
31" x 37" x 26"
49.5" x 39" x .75"
12" x 21" x 15"
7" x 8.5" x 12"
9'10" x 1'3" x 1'1"
9" x 6.25" x 6.25"
35" x 10" x 10"
8.25" x 13" and 5.5" x 7"
17.25" x 6" x 6"
8.5" x 10.5" x 6.5"
8" x 6" x 4.5"
9.25" x 5.5" x 5"
14" x 21" x 20"
9" x 13" x 12"
5" x 8" x 7" to 6" x 9" x 8"